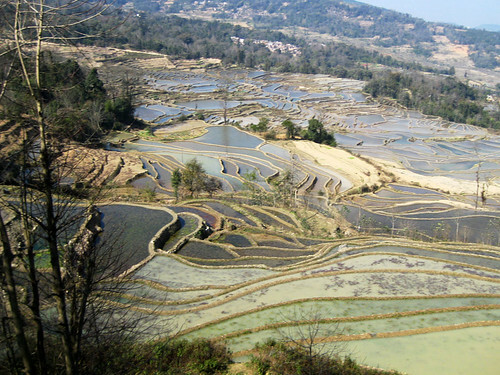 World's Largest Terraced Paddy Fields can be seen in the Yuan Yang, Honghe, Yunnan, China. The terraces decrease the surface run-off of rain waters and also prevent erosion of mountain soil and are therefore very efficient way of growing paddy crops which require large amount of water. 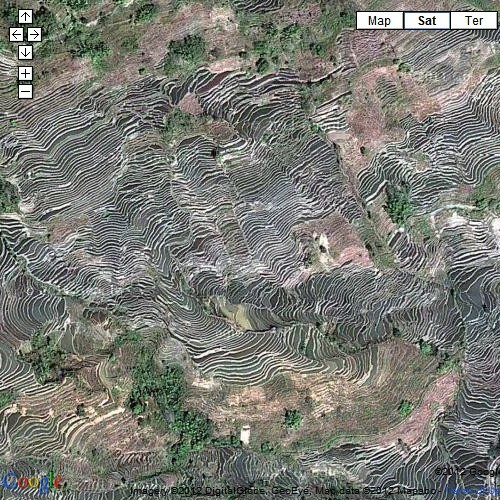 The Hani people of the Yuan Yang region have been using this technique of cultivation since ancient times and have created a vast area of terraced paddy fields by manually digging up the dry mountain slopes. The rice terraces start from the summit of 2,500 metres high Ailao Mountains and go down about three hundred metres, right up to the Red River bed creating an amazing landscape of terraced steps spreading over several hundred hectares. The rice in the region is harvested yearly in August/September, thereafter the terraced fields are gradually filled with water till the sowing season in April next year. The sunlight creates a hue colour on these sloping arrays of water filled terraced pools. In August/September when the crop is ready for harvesting the entire mountain face turns to golden yellow. The spectacular terraces which look more of a gigantic painting than a real landscape are photographers delight. Chinese officials have billed these fields as World's Largest Man-made Land Art and are striving to get these the status of World Heritage Site. A look at the amazing images of these fields is an ample proof of their contention. 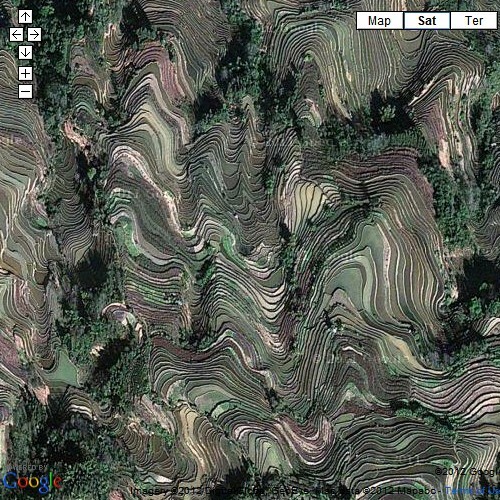 To fully appreciate the vastness of these fields, these must be viewed in Google Earth or Google Maps. View in Google Earth / Google Maps. Credits: MadDonald, member, Google Earth Community for placemarking the location.